Tameichi Hara's wartime autobiography stands out as one of the best memoirs ever written by a Japanese military leader. Hara was considered a national hero during the war for his daring and successful exploits in 1942 and 1943 as a destroyer captain. 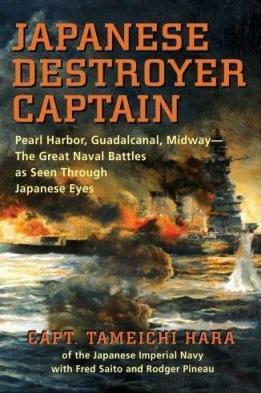 In the book Japanese Destroyer Captain, he vividly describes battles in which he participated and frankly evaluates both his and others' decisions and actions. When the Japanese Navy turned to suicide attacks in the latter stages of the Pacific War, Hara played two key roles even though he personally taught his men the importance of survival and considered suicide tactics to be inhuman and intolerable. From May to December 1944 and also in the last few weeks of the war, he served as commander of Kawatana Base near Sasebo City in Nagasaki Prefecture. Kawatana was a training base for shinyo explosive motorboats to be launched from land bases to ram advancing enemy ships. In December 1944, Hara became commander of the light cruiser Yahagi, which led nine ships that escorted battleship Yamato on her final suicide sortie toward Okinawa. On April 7, 1945, Yamato, Yahagi, and four of eight escorting destroyers were sunk by American air attacks. Hara survived the sinking of his ship and returned to Kawatana to continue his training duties. The many details in this book reflect Hara's thorough research, which included interviews, naval records, and personal statements submitted to him. The Foreword explains that the book attempts to objectively and comprehensively portray the Japanese side during WWII. 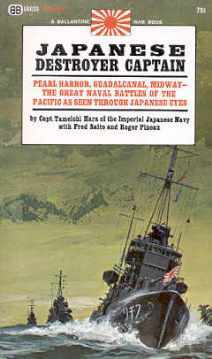 Japanese Destroyer Captain was originally published in Japanese in 1958, and journalist Fred Saito interviewed Hara more than 800 hours as part of translating and expanding the original book. Roger Pineau, coauthor of the Kamikaze Corps history The Divine Wind (1958), also coauthored this book and assisted by verifying the accuracy of battle accounts. The resulting English book first published in 1961 turned out to be first-rate storytelling with great care taken in regards to historical facts and translation. The heart of Hara's memoirs covers the battles he participated in as a destroyer captain in 1942 and 1943 with about two thirds of the book dealing with these two years. The book has five parts in chronological order starting with his upbringing in Kagawa Prefecture in a former samurai family and ending with the sinking of battleship Yamato. After graduation from Etajima Naval Academy in 1921, he had several assignments as destroyer chief torpedo officer. For three years he secretly tackled a private project to prove the faults of existing Japanese torpedo doctrine and to develop a new manual. When published in 1932, his results were quickly accepted and led to marked improvement in torpedo marksmanship. He was given command of his first destroyer in November 1934 and commanded several destroyers through December 1943, when he got assigned to the Naval Torpedo School at Oppama near Yokosuka and then later to the torpedo boat school at Kawatana. His final ship assignment was to the light cruiser Yahagi, which sunk along with battleship Yamato on their suicide mission toward Okinawa. Since the beginning of the Pacific War, Hara commanded a destroyer in many sorties (over 100 according to his count) and came back victorious. He commanded the destroyer Amatsukaze from October 1940 to January 1943 and participated in several battles including the Battle of Java Sea, the Battle of the Eastern Solomons, and the Battle of the Santa Cruz Islands. During the Naval Battle of Guadalcanal in November 1942, Amatsukaze suffered severe damage with more than 30 large holes and with countless holes from machine-gun bullets that killed 43 crewmembers, but the ship succeeded in sinking the American destroyer USS Barton (DD-599) with torpedoes. After returning to Japan and getting assigned to Yokosuka Naval Station, he fell ill and took several weeks to recover before his next assignment. Shigure, the flagship of the destroyer squadron he commanded from March to December 1943, became the Navy's most famous destroyer with much publicity surrounding battle successes in the Solomon Islands without losing a single crewman despite the loss of other Japanese warships. Hara earned the nickname of "Miracle Captain" as Shigure survived even though about 30 other destroyers of the Tokyo Express were sunk as they tried to provide supplies and reinforcements to the Japanese forces fighting in the Solomon Islands and New Guinea. The strong personality and independent beliefs of Captain Tameichi Hara show from an early age to the end of the book when battleship Yamato sinks signaling a symbolic end to the Japanese Navy. He abhorred the physical discipline inflicted upon students at Etajima Naval Academy, which he attended from 1918 to 1921. Later in his career, he completely banned physical beatings when he ran across a new gunnery officer who gave blow after blow with his fist to a crewman who failed to salute even though this was the same crewman who was an expert spotter that previously had been the first to recognize an enemy submarine. Hara again and again demonstrated attitudes and opinions that differed from certain superiors and leaders, but he somehow managed to keep getting promoted in the Japanese naval hierarchy. Probably his most rash action took place while serving as commander at the training base in Kawatana, when he went in July 1944 to the Naval Ministry in Tokyo and delivered a written petition to Rear Admiral Prince Takamatsu, younger brother of Emperor Hirohito. Hara wrote that Japan had already lost the war, and he urged the Emperor to end the war and as a first step to dismiss incompetent admirals and generals unfamiliar with modern warfare. He never heard what happened to his petition, but most likely Prince Takamatsu never showed it to anyone in the Naval Ministry since Hara would have been dealt with severely if any admirals there had found out. As you know, hundreds of our comrades have flown bomb-laden planes on one-way missions against the enemy. Thousands more of these flyers are standing by at every airfield. Hundreds of our comrades are ready in submarines to man one-way torpedoes. Thousands of others will drive explosive torpedo boats or crawl the bottom of the sea to fasten explosive charges against enemy ships. Our job in this mission is part of the same pattern. Our mission appears suicidal and it is. But I wish to emphasize that suicide is not the objective. The objective is victory. You are not sheep whipped to a sacrificial altar. We are lions released in the arena, to devour the enemy gladiators. You are not to be slain merely as sacrifices for the nation. Do not hesitate to come back alive. We must force our way against any enemy effort to intercept our mission. But you must not give up your lives cheaply. Once this ship is crippled or sunk, do not hesitate to save yourselves for the next fight. There will be other battles. You are not to commit suicide. You are to beat the enemy! Yahagi sunk from American bombs and torpedoes about 15 minutes prior to Yamato going under. Hara grieved at the loss of the two warships as he clung to a piece of wood in the oil-covered water, but one of the surviving destroyers rescued him and returned to Sasebo. Hara's critical assessment of Japanese Navy's leaders and strategy and his detailed description of his role in many naval battles make his memoirs an extremely valuable historical document. Some of Hara's comments, such as the speech he made to Yahagi's crew prior to departing on the suicide mission with battleship Yamato, most likely were heavily edited, since it is unlikely that Hara would remember the exact words more than ten years after the end of the war. His comments about Japanese suicide attacks such as Yamato and shinyo motorboats make clear than not all military leaders favored these tactics, but his remarks also show that nobody had enough influence to stop Japan's military leaders from making suicide attacks the central military strategy from October 1944 until the end of the war.